Growing tired of the long winters, Glen, a musician and former VP of a computer technology firm and Mara, a retired kindergarten teacher and opera singer, started researching places to retire. They found that locations in the States, were either too humid…or too expensive. When Glen read that Cuenca was number one in the top places to retire in the world, he was intrigued. “I had never heard of Cuenca, much less Ecuador, so I thought this can’t be right,” says Glen. When they looked at the other places on the list—all were inexpensive, and had good healthcare, but were hot and humid—they agreed, Ecuador was for them. 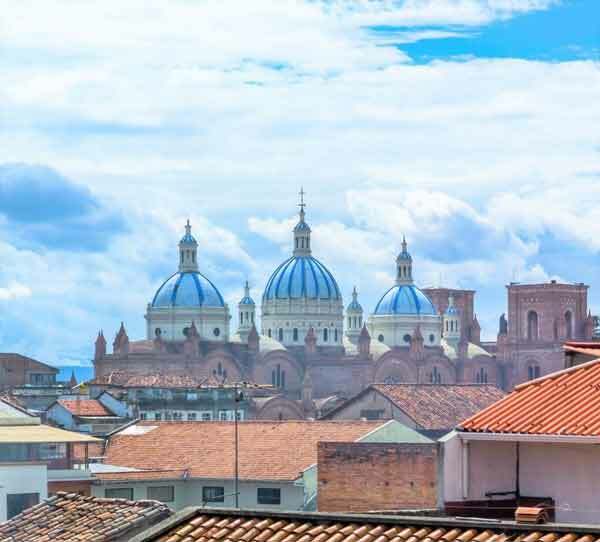 Cuenca, is home to around 5,000 expats and is highly touted for its cobblestoned streets, lined with quaint shops stocked with indigenous crafts, and restaurants serving $3.50 traditional almuerzo (lunches). 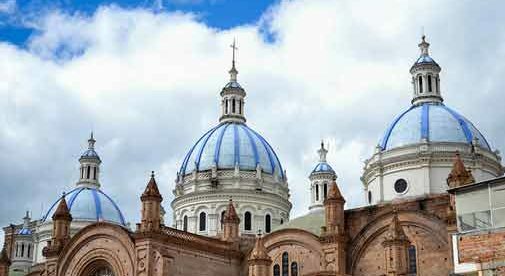 The most iconic pictures of Cuenca are those of the blue domes of the New Cathedral. Downtown (El Centro) serves as a large gathering place for expats and Ecuadorians and sits next to an internationally recognized flower market. Located in the southern part of the Andean Mountains in a valley encased by four rivers, Cuenca immediately checked off many things on the Gano’s list…including a vibrant musical culture for the two musicians who wanted to reignite their music careers. They sold their home in Anchorage, banked the money, and rented a condo for $650 a month next to the Yanuncay river with views of the New Cathedral mosaic domes downtown. But soon realized, that they could pay cash for a house at half the cost of what their Alaska house cost…and still have enough money to travel. Glen started scouring websites and found a townhouse he felt would fit their needs, that was being sold by an expat. They paid cash for the fully furnished, modern 1,700-square-foot, three-bedroom, two-and-a-half-bathroom townhouse in a gated community. “The neighborhood doesn’t have North American “curb appeal” but it had everything we needed. It had lots of bus lines to get us around town…we wouldn’t have to buy anything to move in…and we wanted to be in an Ecuadorian neighborhood,” says Glen. “And the refrigerator is the biggest one I’ve ever had,” adds Mara. “We knew immediately this was the right place for us. Because we paid cash, it only took a few weeks to close on the house,” says Glen. The open floor-plan of their new home looks like an Architectural Digest feature story. The kitchen—complete with stainless steel and high-grade appliances—opens directly into the dining and living room, which gives them plenty of space for entertaining. A desk and working area downstairs (with a heated floor), gives Mara a warm place to run Colibri Conciertos (Hummingbird Concerts)—her music promoting business that hosts intimate concerts by professional Ecuadorian musicians in private homes of local expats. The value of the all-inclusive furnishings was estimated at about $20,000 and because it fit their tastes right down to the art work on the walls…it was move-in ready. The home is only a 15-minute, $3 taxi ride to El Centro, allowing them lots of time to keep up their active lifestyle. This includes Glen playing his favorite tunes by Bob Dylan and John Prine in a local band, while Mara—who has a master’s degree in voice—keeps busy planning concerts and singing in their church’s choir.